Asphalt is the dark or dark color sticky substance that contains bitumen as the essential constituent. Asphalts are to great degree complex materials that contain immersed and unsaturated mixes. The structure contrasts relying upon the unrefined petroleum attributes. Asphalt ordinarily incorporates 80% carbon, 10% hydrogen, 6% sulfur, and little amounts of nitrogen and oxygen. Vinayak manufacture is a pioneer in Asphalt drum mix plants. The vinayak manufacture combines simple design with the most advanced control technology and massive construction unmatched in the industry. Backed by world class item support and preparing, vinayak manufacture provide contractors years of dependable long life with minimal effort low maintenance operation for the highest profitability. The manufacture materials which are used in the manufacture process of this plant acquired from the dependable and certified vendors from the industrial market. Vinayak has taken top respect year after year for being the only hot mix plants with a positive unpredictable catch and recovery framework that totally eliminates blue color shading smoke and asphalt scents from the process and feeds them to the combustion process as fuel. Our range of asphalt drum mix plants starts from as low as 70 tons per hour capacity. The plants are designed and engineered to give trouble free performance with enhanced fuel efficiency using latest technology. Vinayak manufactures offer this model in capacities of 3o TPH to 150 TPh. The Asphalt drum mix plants is highly demanded by private contractor’s state government road department and industries defense Indian railway etc. many more. Asphalt Drum Mix Plant also known as hot mixed plants. Asphalt drum mix plants is materials for clearing more often a mixture of graded high quality diverse size of total which are heated and mixed with fluid bitumen in measured of quantities to produce hot mix asphalt. Asphalt is a clearing materials made out of smashed rocks and bitumen. Vinayak is premium manufacture asphalt drum mix plants require complex process engineering which very relies on ideal cooperation between all segments. All this components are highly useful for manufacturing all vital parts including Burnerm, mixer, screen, drum, filters, feeders and controls etc. Feeder: - Feeder at the bottom of bins adjustable gates is provided to regulate the flow of aggregate with auxiliary conveyors. Each feeder having 30t capacity. It has having vibrating motor for easy flow of fine materials. Controls: - The controls center manages operation from a central location. Most modern asphalt plants are sophisticated facilities and are computer controlled. It control accurately and flow rate are adjusted with precision gates. Screen: - Vibratory screen removes the oversized and unnecessary materials from feeder. Asphalt is mixed up with the hot aggregate in the drum with different location it depend upon which type of the drum you are selecting. Storage unit: - Vinayak offers a wide range of filler storage and feeding solution of customer s to choose from depending on your requirement. Bitumen Injection: - A high limit hot oil jacketed outfit type pump controlled by an AC variable speed drive feeds the metered amount of bitumen into the blending area of the Thermo drum unit. Cold Feed Bins: - Stockpiled aggregate are loaded into the cold feed bins for delivery into aggregate dryer. Each bin holds a separate aggregate size. They have an adjustable gate that meter the aggregate into the mover conveyor belt. This gate opening and the conveyor belt speed control the amount aggregate introduced into the plant. The asphalt ingredients are fed continually to the turning drum that conveys a general generation of the hot blend. The major hot components are the totals, asphalt, and the mineral fillers. The totals are exchanged by the transport from the feeder containers to the rotating drum. The burner removes the dampness content from the total, and after that the total is warmed to accomplish the coveted temperatures. The hot aggregate is heated and covered with asphalt and the filler materials. The hot blend is exchanged from the asphalt to vehicles by the heap transport. The feeder bins organizing sorting out unit with asphalt tank, and the mineral filler unit a urged to keep up the most possible ideal level of the hot blend fixings. The dust is amassed by the clean gatherer, and gone through experience the pollution control unit, before it getaways to nature. The advantages of using Asphalt drum mix plants manufacture by Vinayak is that it can operate on multiple types of fuel including like diesel or low-density fuel which makes it pretty versatile. As different quality of plants is available by Vinayak Manufacture of road construction. An asphalt drum mix plant is highly reliable its texture is very smooth and stays convenient for obtaining driving experience. 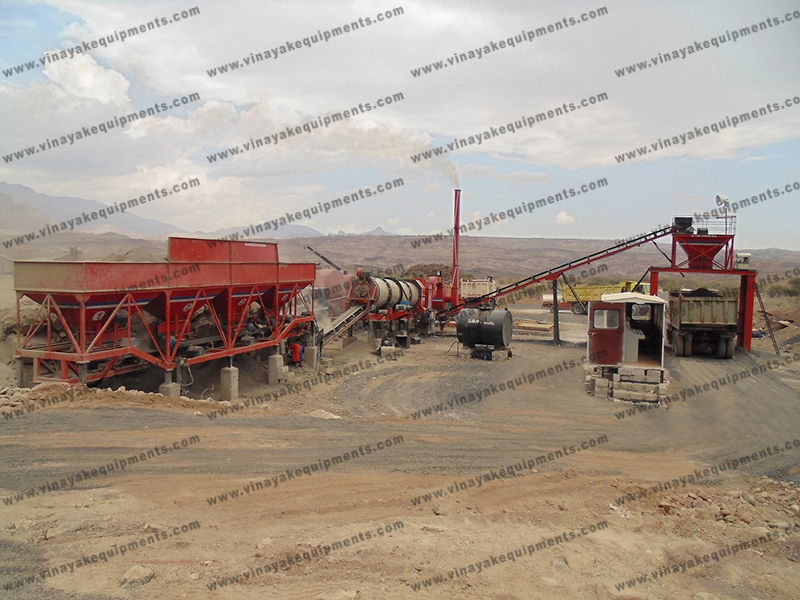 Asphalt drum mixing plants is exclusive equipment applied to blend and aggregates. It has been developed and features with dust collection system to collect the dust produced at time of mixing materials.